 » You&apos;re currently reading "Kieran Brown: “I can`t wait to be back in Hamburg”"
The RMS Titanic will dock in Hamburg. The new London Tour Production will run at the Staatsoper Hamburg from 7-19 August. 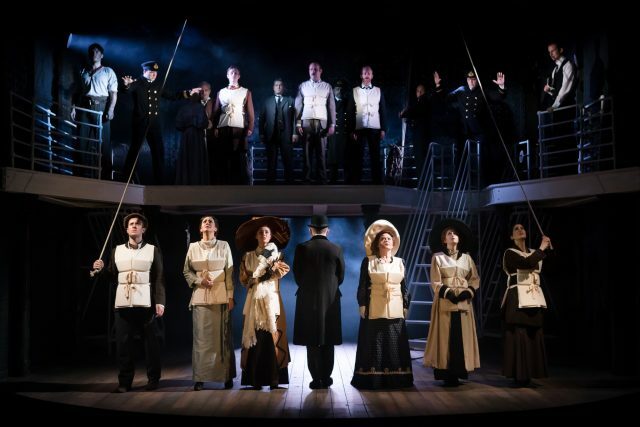 Based on real people aboard the most legendary ship in the world, Titanic The Musical is focused on the hopes, dreams and aspirations of her passengers. We had the opportunity to have an interview with the Scottish singer and actor Kieran Brown who plays the role of First Officer William McMaster Murdoch. It’s been an absolute dream. We’ve been to some incredible cities and theatres, and seeing how different venues have reacted to the show has been fascinating. It’s a fantastic mix of cast and crew, a mixture of ages, and we’ve all gotten along incredibly well, which can be quite rare – usually living in each other’s pockets for so long can create tensions but that hasn’t happened so far on this job. We also have had some great times on the tour, from themed birthday parties (for my 40th we had a “Night Of 100 Madonna’s” party and everyone dressed up), a 90’s themed party, lots of great nights out and activities during the day etc, all of which help keep the positivity and energy flowing. How many cities/venues does the tour include in total? We opened in Southampton, then to Belfast, Cardiff, Manchester, Dublin, Sheffield, Glasgow, Birmingham, Edinburgh, Plymouth, Northampton, Nottingham, Blackpool, Bromley, Bradford, Liverpool and finishing here in Hamburg. Been quite an epic amount of travelling! Did you know the musical and especially your role beforehand? I was introduced to “Titanic” just after it opened in 1997. I fell in love with the score but if I am honest I hadn’t listened to it for a long time before I got the job. I saw the production at Charing Cross after it transferred from Southwark and was reminded about how beautiful the music and story were. I did a lot of research into William Murdoch online. It was very interesting reading varying accounts of his ultimate fate. I think our production handles it very sensitively, unlike the James Cameron film. He was a very stern natured man by all accounts, very much devoted to his job and his wife and children. Took himself very seriously, as one would expect coming from a naval family. How does it feel to play a ‘real’ character in a musical about a ‘real’ event? Does it feel different from portraying a fictional character? 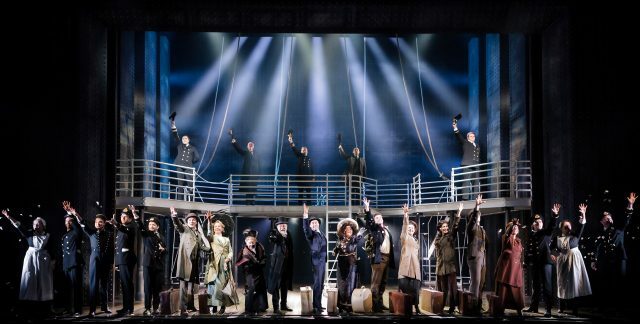 Is “Titanic” just a Musical for you or do you think about the sad destinies of the people who died there? It’s definitely not just a musical. It’s impossible, particularly the way this production is staged, to NOT be reminded every night of the real human tragedy. Anyone who sees the show can’t help but feel the emotional impact and be reminded that this actually happened to these characters who are onstage in front of you. It is very much a tribute to the 1517 people who lost their lives that dreadful evening in 1912. Murdoch’s death is still a mystery, there are different opinions about that. Did he kill himself or did he die in the sea? What do you think? Witness statements from the night indicate that a senior officer was seen shooting himself, in the area Murdoch was last seen. Charles Herbert Lightholler (Second Officer) said during the enquiry that he witnessed someone he knew take their own life, but steadfastly refused to say who it was. It was known that Murdoch felt a huge wave (if you’ll pardon the pun) of responsibility for the ships’ ultimate fate. We don’t show any suicide. It’s again up to the audience to make up their own mind. Certainly Mr Murdochs family dispute this account (as one would expect). His portrayal in the film (where he shot 2 passengers and then himself) caused them a lot of upset and in the end they sued Cameron and 20th Century Fox and won an apology. There are so many factors to take into account and it was so long ago, I think it’s one of Titanic’s mysteries that will likely never be solved. Is it the first time you are performing in Germany? No! I have performed in Germany ALOT, almost everywhere! I did many many tours of The Musical Starlights and Best of Musicals, as lead singer and then a director. I love Germany – anyone who knows me will tell you that. I can’t WAIT to be back in Hamburg! What were the most challenging roles you did in your career so far? I’d say probably The Phantom. Such a complex character and it’s a BIG sing. When you add all of the technical aspects (prosthetics, costume, moving scenery etc), it’s exhausting! Every time I finished playing him, I felt like I had been hit by a bus – I believe if you DON’T feel like that at the end of that show, you’re not doing it right! It was also a challenge for me as an actor to try to make this murdering, obsessed, crazed psychopath someone who the audience was actually rooting for and feel something for at the end. I’d love to go back and explore that vulnerable side of him more at some point in the future… Fingers crossed! Are there any dream roles you would like to play?